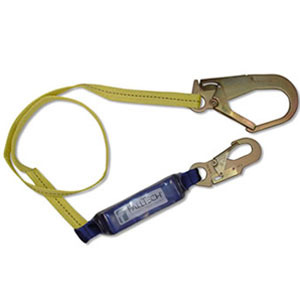 6’ Shock Absorbing lanyard features single-leg construction and utilizes 1” polyester webbing for resistance to UV light and abrasion. Also features a double-locking snap hook at the attachment end and a #18 rebar hook at the anchorage end. •ClearPack Shock Absorber limits arresting forces to 900 – 1,000 lbs or less. •Clear PVC cover protects shock absorber and allows for easy inspection. •The #18 rebar hook has a 2-1/4” gate opening and allows a broader range of connections. •1” Webbing has a tensile strength of 9,800lbs. and features embedded wear-indicating threads. •Meets the requirements of OSHA 1926.